Congress has made the most recent move in a continuing effort to help better manage the mushrooming mid-continent population of light geese. Both Houses have passed the Arctic Tundra Habitat Emergency Conservation Act. The Act will allow the continued hunting of snow geese in spring, after traditional hunting seasons have closed. 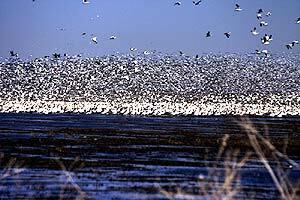 Experts estimate that the number of migratory snow geese in this flock has tripled in the last 30 years  to as many as six million  because of agriculture and other land-use changes to their wintering and migration habitats. There are so many geese now that the birds are literally destroying their fragile Arctic breeding habitat. A special spring hunting season was implemented by the U.S. Fish and Wildlife Service last year, after a coalition of conservation groups and scientists determined that increased hunting opportunities would be the best way to reduce the snow goose population and save the habitat. A lawsuit by the Humane Society of the United States and others failed to stop the hunt, but led a federal judge to direct the U.S. Fish and Wildlife Service (FWS) to conduct an Environmental Impact Statement (EIS) before authorizing another special season. That EIS could take as long as two years to complete. This action by Congress allows the special season to continue while the FWS completes the EIS. "Congress is to be commended for their leadership on this issue," said Dr. Bruce Batt, DU's chief biologist and chairman of the Arctic Goose Habitat Working Group. "This action supports the broad consensus that has been reached, following years of study, by all who have a deep concern for these birds and the Arctic ecosystem that supports them." Recognizing the importance of this issue to snow geese and the other wildlife that depend on this habitat, Ducks Unlimited mounted an unprecedented campaign to inform the public and legislators about the problem and its potentially catastrophic consequences. This campaign led to widespread media attention and recognition by lawmakers, who called for immediate action. DU's concerns were echoed by a coalition of the nation's foremost conservation groups, including the National Wildlife Federation, the National Audubon Society, the American Bird Conservancy, and others.